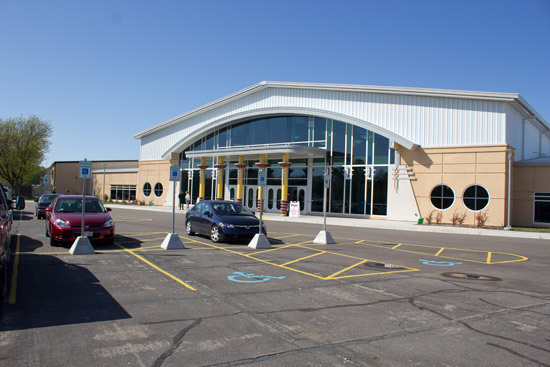 Location: Expo South, Kalamazoo County Fairgrounds, 2900 Lake Street, Kalamazoo, MI 49048, USA. 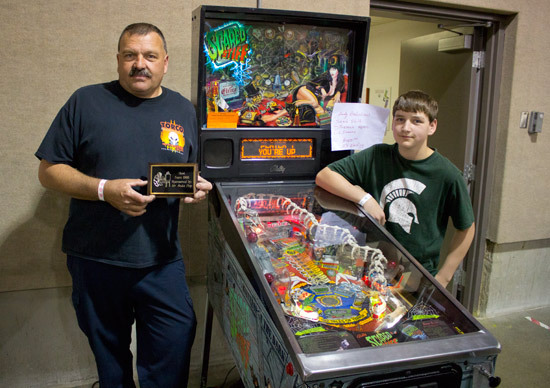 It's been a few years since we last visited Kalamazoo for the annual Pinball at the Zoo show. So we made amends for that this year and took a trip to Michigan to see how, and if, things have changed in the past three years. The Expo building had a new, classier frontage for starters. 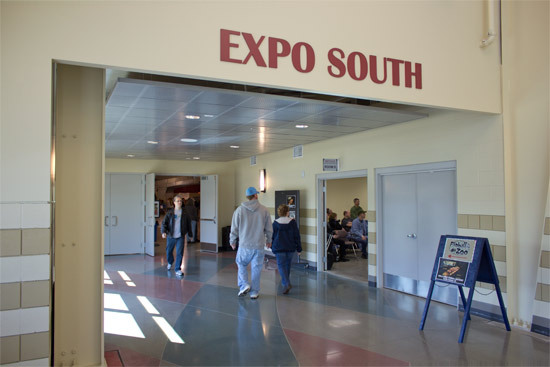 The structure contains two halls - Expo North and Expo South - with the southern one of the pair hosting Pinball at the Zoo. Although the pictures above show the blue skies and bright sunshine enjoyed by visitors to the show on its second day, things were not so good for those setting up ahead of the opening on Friday. 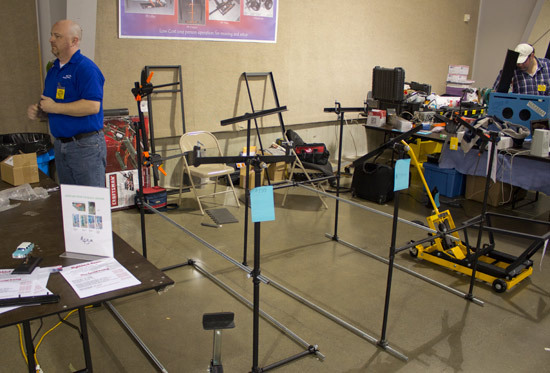 The show is unusual in that it is held on Friday and Saturday, rather than the more usual Saturday and Sunday. Setting up is done Friday morning, with the show opening to the public at 1pm. 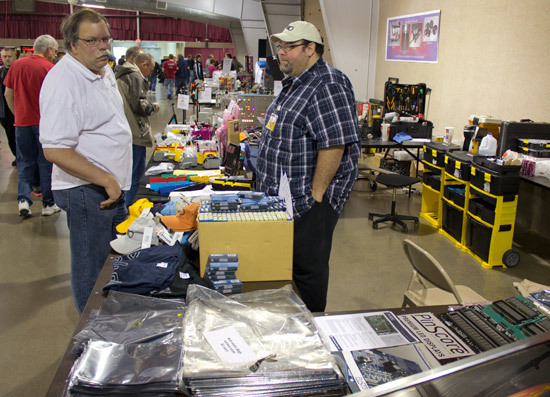 The doors remained open until 10pm on Friday, and re-opened on Saturday morning at 9am with the show officially closing at 6pm. There are advantages and disadvantages to this. 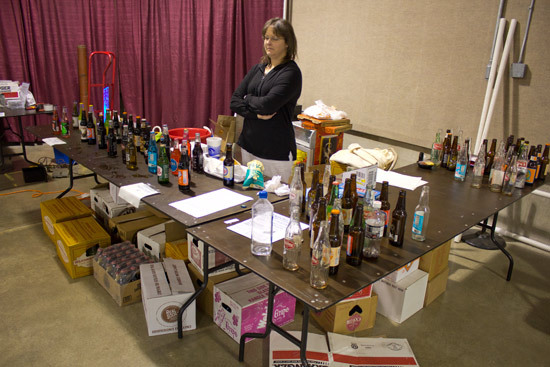 The big advantage is that vendors and those bringing games get to leave Saturday afternoon/evening and don't give up both days of their weekend. The disadvantage is mainly how difficult it can be for some people to be at the show on a normal working day. This makes the Friday a bit quieter than the first day of a show would normally be, and means the busier Saturday winds down fairly early. 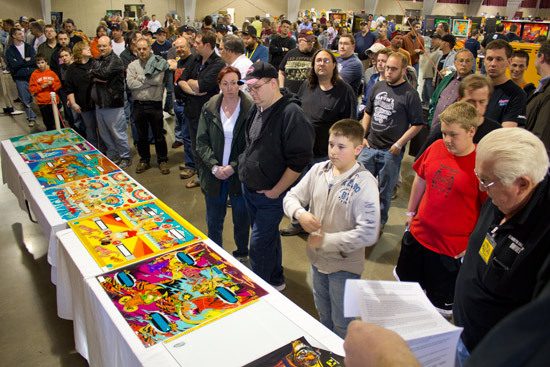 The cost of entry was $12 per day for an adult and $6 for kids aged 5-13. Kids aged 4 or under were free with a paying adult. The show was promoted on two local radio stations and a cameraman from a local TV station was also there filming interviews and covering shots. 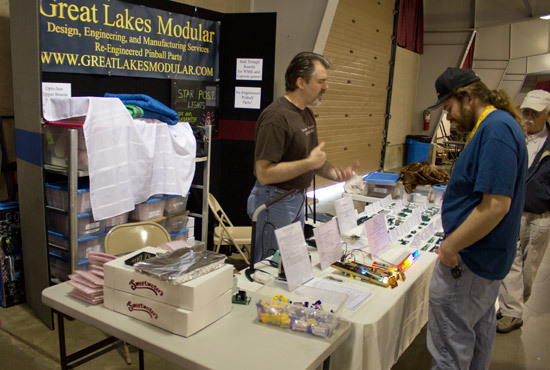 Gradually the hall became fuller as more machines and vendors arrived and set up. 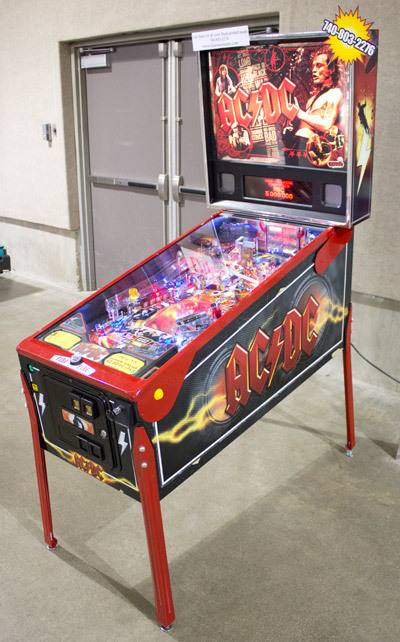 Trent Augenstein of Tilt Amusements brought this AC/DC Premium model. 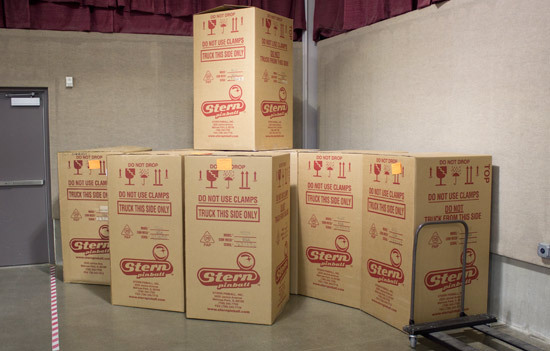 In fact, he brought quite a few new Stern games. 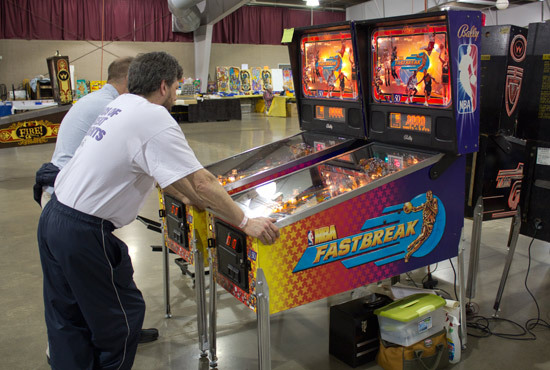 There were two NBA Fastbreak machines set up in head-to-head tournament mode for players to do battle. 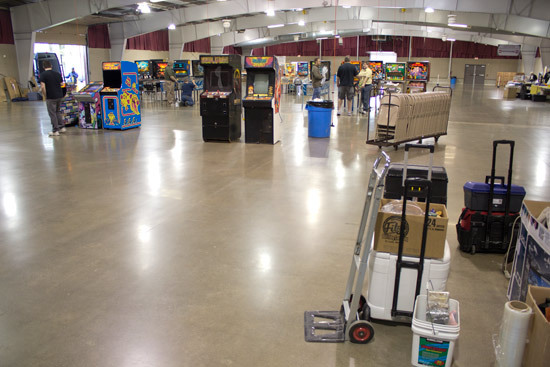 Here's the full list of the 70 machines set-up in the hall on Friday evening. 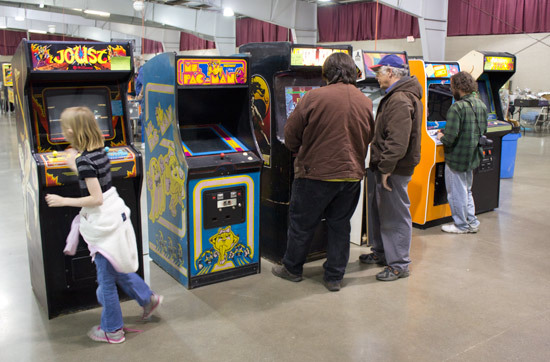 There was also a selection of classic video games such as Joust, Mr & Ms Pac-Man and Donkey Kong Jr, plus some other coin-op games. 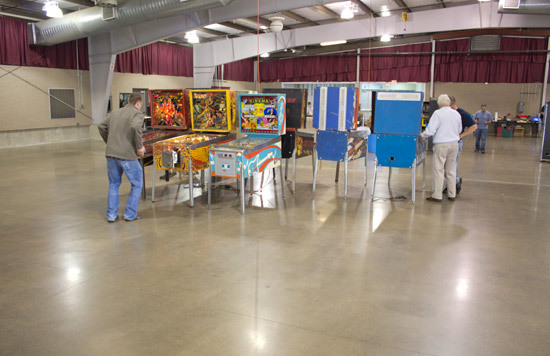 Here are the non-pinball games. 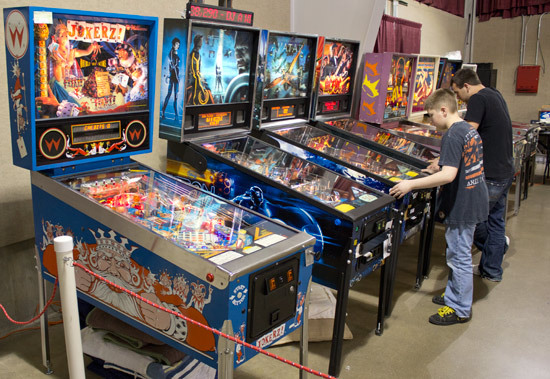 One of the other things which differentiates Pinball at the Zoo from many other pinball shows is the number of machines for sale. 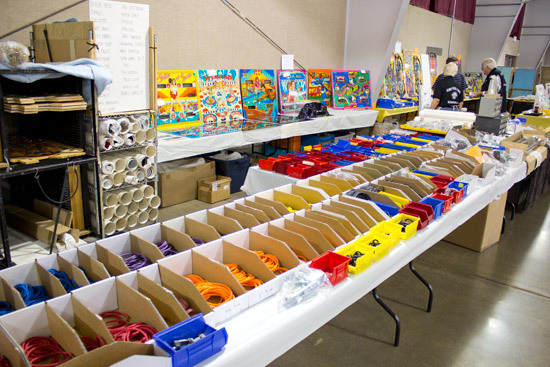 Overall, probably 60%-70% of the machines are brought to the show with the intention of selling them. They're not alone in this, but most other shows will have a much lower percentage. 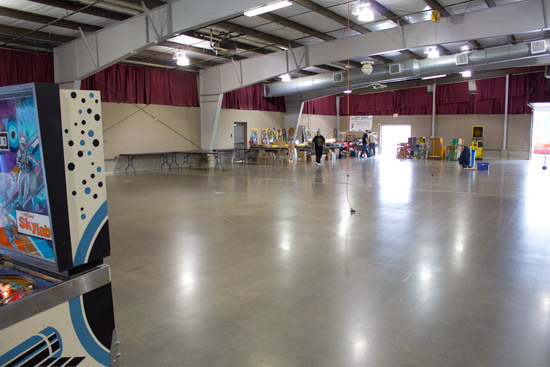 One effect of this is the number of machines which disappear during the course of the show - either to buyers, or into an area set aside for an auction which would take place on Saturday afternoon. 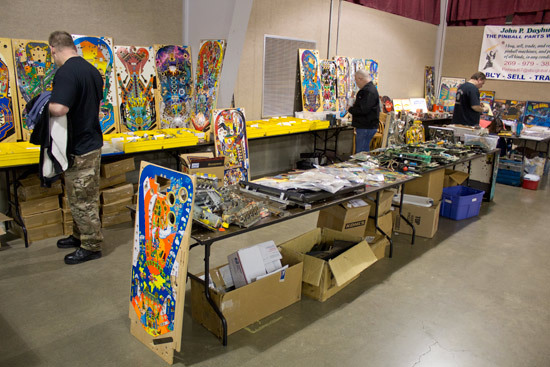 If you couldn't wait for the auction to spend your money, there was a good number of vendors selling everything pinball-related, from screws, lamps and rubbers, to legs, boards and whole machines. 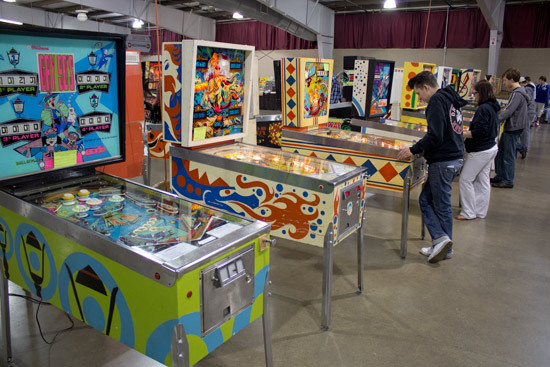 Let's take a look around Pinball at the Zoo with our unique Four Minute Tour - a video walk around the show floor on Saturday afternoon, letting you experience the games, the vendors, the people and the sounds for yourself. 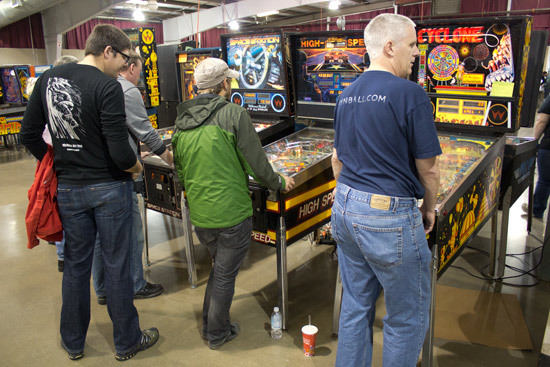 On Saturday there were a few seminars on pinball-related subjects held in a small meeting room just outside the main hall. 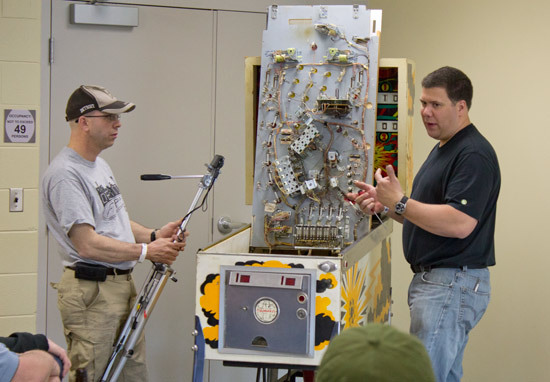 In the first of these, John Kirby and Clay Harrell hosted a talk on repairing and restoring electro-mechanical machines. 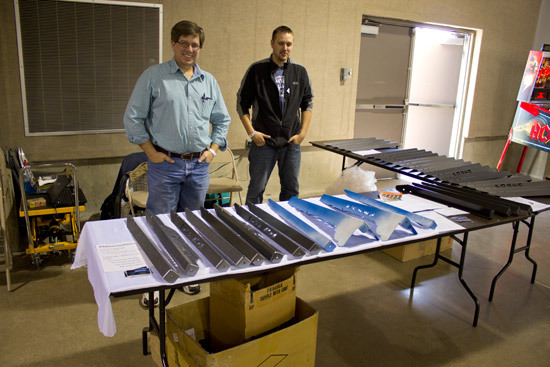 The pair explained how the various electro-mechanical mechanisms work, and what to lubricate and what to not. John looked at the disassembly, cleaning and repairs he carries out as part of the full restoration service he offers. Clay examined the other side by explaining the maintenance and repairs he carries out - and those he does not - when making a typical two hour home visit, where the owner is paying for his time. John and Clay also returned later in the day for a second session on EM troubleshooting and repairs. 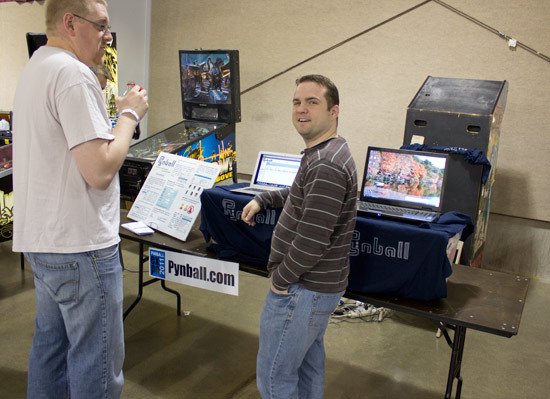 The second seminar featured John Watson who was explaining the workings of the Pynball.com pinball trading website. 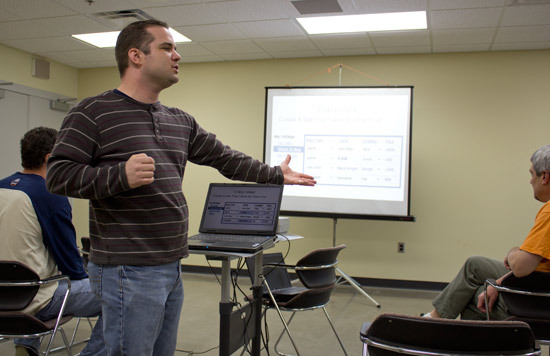 John demonstrated the service by setting up a user account for one of the audience members and entering the machines they are looking for and those they would consider selling. He then guided them through many of the features the website has to offer. 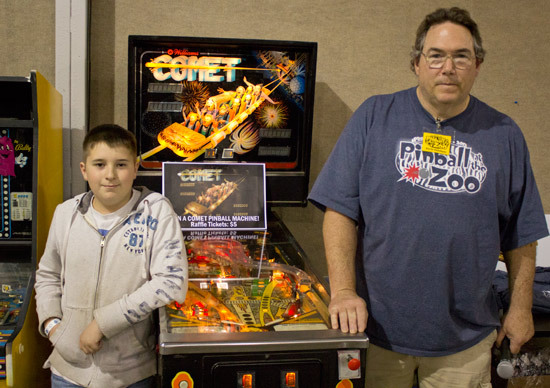 ...the winner was Andrew Rosa, who got to take home the Comet machine. 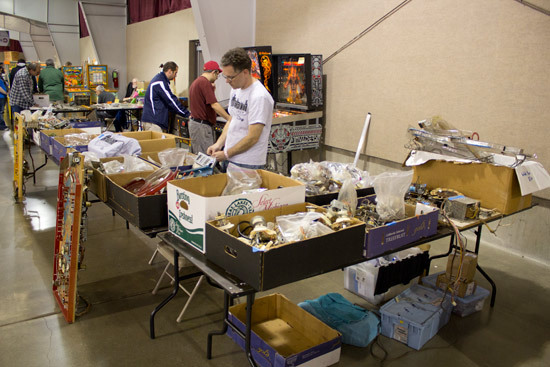 Saturday's action closed with an auction of pinball and video games, and assorted hardware. 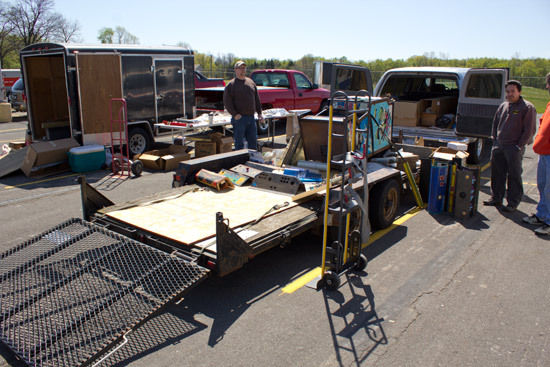 John Dayhuff was the auctioneer and a good-sized crowd gathered in the hope of snagging a bargain. Here are the auction results. Thanks to John for providing them. 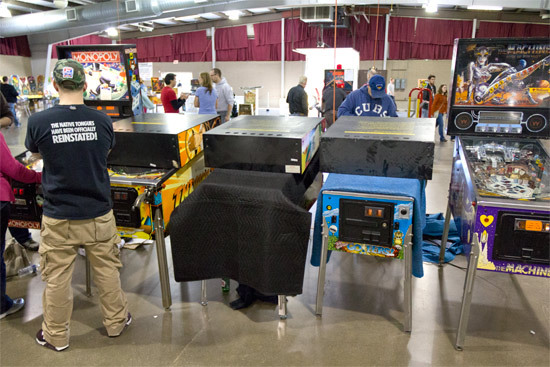 Gottlieb playfield for a redemption game? 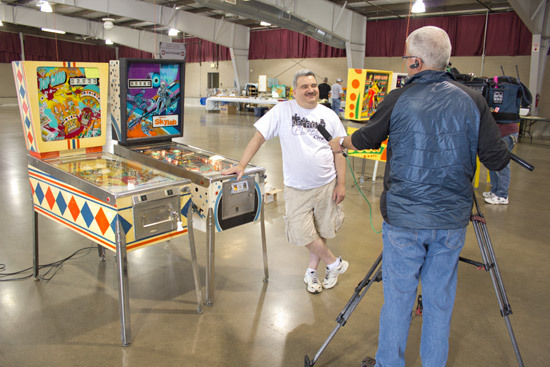 As usual, there were a number of tournaments at Pinball at the Zoo which were organised by Andy Rosa. Many of the big names were there from the Chicago and Detroit areas - the Sharpe brothers, Lyman, Trent, etc. 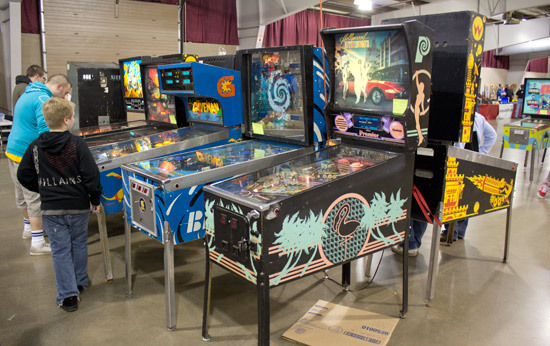 The Open Division was played on four machines - Jokerz!, Tron, Avatar and AC/DC - while the Classics was held on Ali, Split Second, Black Pyramid and Coney Island. Entry to the Open cost $4 per ticket or three tickets for $10. Each ticket entitled you to one game on a single machine. 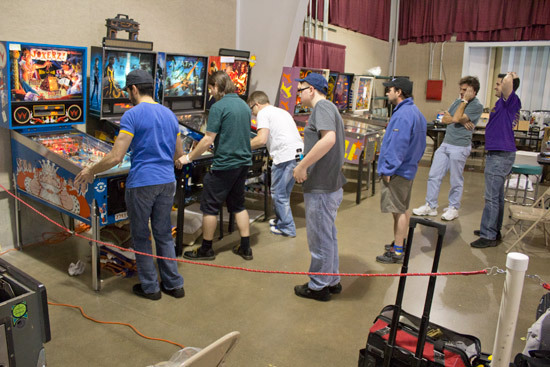 Consequently, a minimum of four tickets ($14) was needed to record one qualifying score on each Open machine. 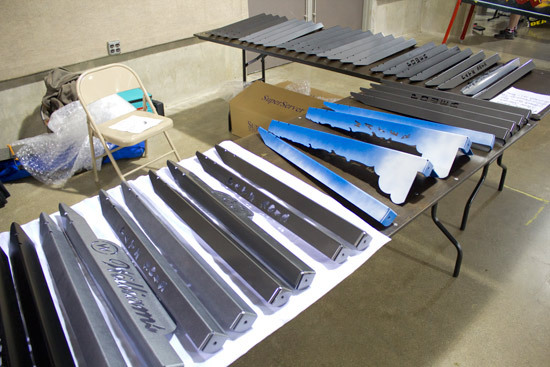 In practice, most players bought multiple attempts. 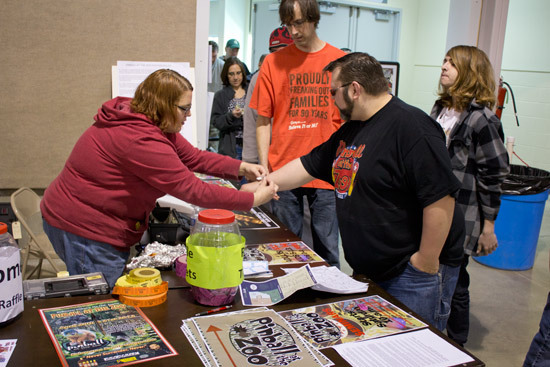 All entry fees were paid in prizes to the winners. The Classic division cost $2 per entry with 50% of the fees going to the top players and the other half going to the American Cancer Society. In addition, players were expected to pay for their games. AC/DC cost 75c per game while most of the others were 50c. 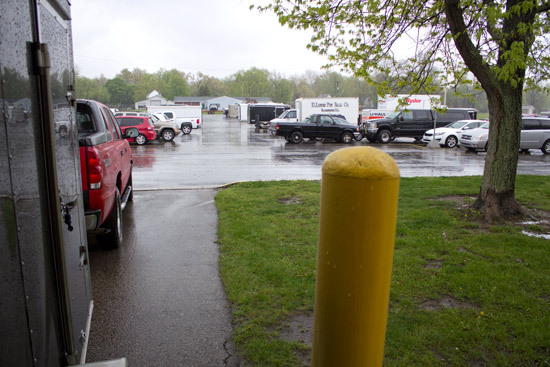 Unfortunately, we were not able to stay for the finals which continued past the point where nearly all the other machines had been folded down and packed away. However, it was Trent Augenstein who triumphed to take first place ahead of Zach Sharpe in second, Joshua Henderson in third and Josh Sharpe in fourth. 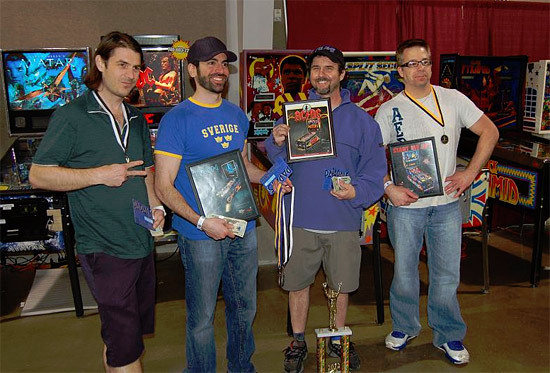 In the Classics, Trent and Zach featured in the top four again, but it was organiser Andy Rosa who won with Joey Springer taking second place. Zach was third and Trent fourth. 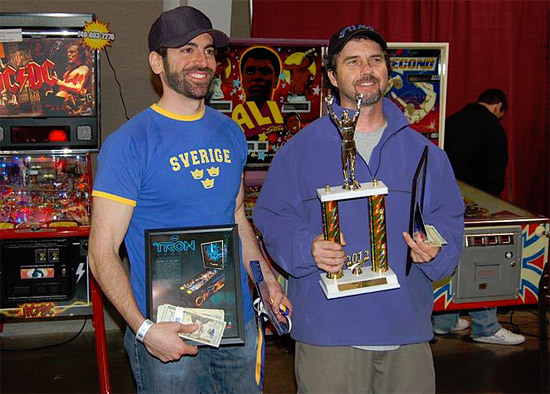 Meanwhile there was also an Amateur division played on Coney Island and Tron where it was a win for Clint Williams who beat Willie Strong into second place, with Terry Groves in third and Bill G in fourth. 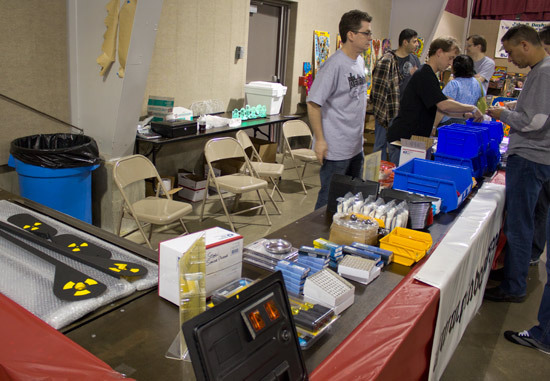 There was no entry fee for the Amateur division, but again players had to pay for their games. There was also a Youth division which was played out on Coney Island and Avatar at a cost of $1 per entry (plus the cost of the game). We do no have the results from that yet. 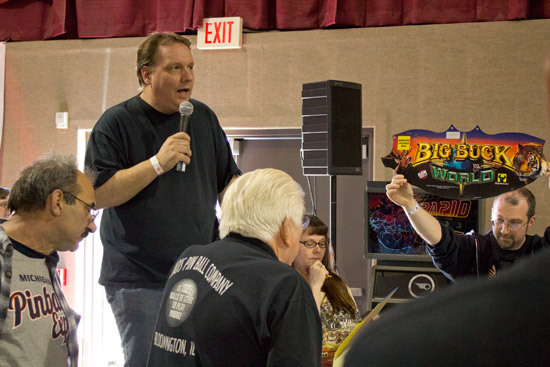 All of which brings us to the end of this report from the Pinball at the Zoo 2012 show. PatZ is a much more relaxed and casual show than many others. The show format has changed little over the years and there are no special guests or surprise new features. 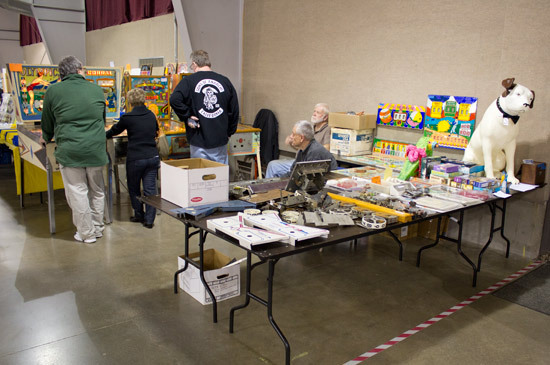 It's all about local collectors and traders bringing machines to the venue, meeting buddies old and new, and seeing what they come home with at the end. 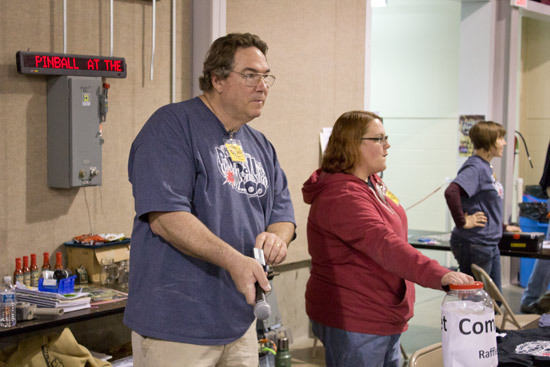 Kevin and his team put on a fun and enjoyable couple of days out at the Kalamazoo fairgrounds, and ensure everyone there has a great time.